Best Memory Foam Toppers -- Guide To Finding The Right Memory Foam Mattress For You. I must have looked and tried dozens of toppers over the last 20+ years in the memory foam business, and I can tell you a lot has changed. I recently stopped selling memory foam mattresses and toppers due at first to supplier issues and then a health crisis that has sort of made being a retailer impossible, but I wanted to share with you my experiences and knowledge that I picked up over all these years so hopefully you can find the right memory foam mattresses for you -- both in comfort, price, and also making sure you get a money back trial that assures you don't get taken. Back when I first started, the only option were $800+ 3" toppers from Tempur-Pedic (tm) -- which I bought out of desperation from waking up with such severe back pain each morning. And it really made a difference -- I had a lot less pain and more mobility in the morning. But almost no one could, or wanted to, afford that expensive of a topper. Tempur-Pedic (tm) quickly figured out that if they attached the topper to an underlying support foam and made the thing a whole mattress -- well, the rest is mattress history as they have become the largest mattress manufacturer in the US after their merger with Sealy. It took a few years, but other foam manufacturers starting making their own memory foams and now it is everywhere you look -- and a lot of the memory foam toppers out there have gel blended into the memory foam. So how to find a really comfortable topper out of all these choices? I liked the feel of pure memory foam the best in terms of comfort over gel memory foams. The gel liquid or beads just make the foam feel stiffer and not as comfortable. I also liked the feel of 4 lb density memory foam -- it had the nicest initial feel, had the density to provide a lot of cushion and pressure relief, and would give you a good 3 - 5 years of useful life. Memory foam under 3 lb just didn't provide this kind of comfort and 5 lb memory foam often felt stiffer and just not as cozy as 4 lb memory foam. The latest generation memory foams offer much better air flow since they have a more open cell structure than older, less expensive memory foams. When I went to these latest generation memory foams for my toppers I got almost no complaints about either the topper sleeping hot or having any initial odor issues (since I think the more open cell structure both let through a lot more air and allowed the pads to air out the odor from manufacturing much more quickly). I found no need to go to a gel foam to help people sleep cooler, as the hype for them goes, since these latest generation memory foams just didn't get complaints for sleeping hot and were a softer, more comfortable feel than gels. How do you find these kind of toppers -- offering pure, latest generation memory foam? Not all the sellers give this sort of data, but a lot do tout the 200% or whatever greater air flow. But often you do have to ask for these details or try to find them in their customer reviews. I also only wanted to carry foams that met the Certipur-US standards since these insured the foams met very high standards (low VOC, no formaldehyde or heavy metals, no PBDE, etc.) This is an expensive process to go through and also hard to meet this standard, so those companies offering Certipur-US certified foams tend to tout this so you will know. I also looked for toppers cut full to the actual size of the mattress rather than an inch or two short as somehow a lot of toppers do get cut. I don't know why this became something of an industry standard, but I know people liked having our topper go to the edge since they wanted it to cover the full size of their bed. Finally, I did look for suppliers that were willing to offer good warranties -- which I think should be 3 - 5 years on a topper. Unfortunately, all too many warranties aren't worth the paper they are written on since any cracks or areas that get softer or even form depressions over time are just looked at as normal wear and tear. I fought this, but it is really hard to get a replacement often unless the depressed area is permanent and an inch or deeper, and the cracks just are chalked up to normal foam wear. I only looked at 2" and 3" toppers. 1" just didn't provide any real cushion, and if you think you needed 4" since your mattress was so stiff, then my opinion was that you were better off spending your money on a new mattress that you thought was comfortable rather than on a topper that wouldn't fix the actual problem. I got asked often whether to go with a 2" or 3" topper. And for most people whose mattress was just firmer than they liked and had some pressure soreness in their shoulders or hips, 2" of this high quality memory foam usually worked. 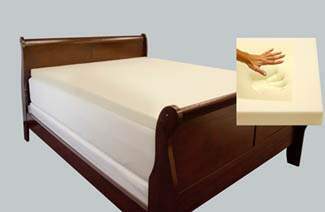 But if your mattress is very firm or you just like a softer, plusher feel, then you might like the 3" better. And while it is just an inch difference, it somehow makes a big difference in feel -- you just sink into a 3" topper a lot more than a 2" topper. Lastly, since you just never know if a topper will fix the problem (it definitely might if your mattress is too firm, but if it already is too soft or has dips, then not), look for one with a good money back guarantee. At least 30 days, but hopefully longer. I hope that these tips help you to sort through the toppers you are looking at -- and then, after narrowing, you can take a closer look at the reviews (with a critical eye knowing all these things to look for) and hopefully find a topper that will really help you get the quality sleep you are looking for.